Judy Vizzari interviews Duang Tengtrirat and Rob Reid Smith, from Research. 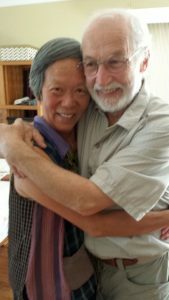 Obviously, the article is mostly focussed on food-related matters but if you want to read more about Duang and Rob’s life history, click here to read a sister article that Judy has written for Nillumbik University of the Third Age (U3A). Every so often life offers something different, something enriching and pleasurable and Thursday, 11th January, 2018 was, for me, just such a special day. Duang Tengtrirat and her husband, Rob Reid Smith, live in the back blocks of Research. I’m visiting them to find out about their long list of accomplishments which, I’ve heard, include innovative gardening techniques, abundant food production, waste-free cooking and largescale catering. I also want to hear about their contributions to the learning and health of our community. Their fame has preceded them but I am keen to learn more. The day is hot, 30+ degrees Celsius. I set off along Reynolds Road in the hills of Research and soon find myself passing through the kind of untouched bushland you’d only expect to find further away from suburbia – hard clay, ochre-coloured earth, golden clumping grasses, tall eucalypts, a canvas of soft, dry olive greens and browns all bathed in misting dust and backed by brilliant blue sky. Beautiful? Yes, in a wild, Australian kind of way, but not the sort of land which looks, to me, like good farming country. I’m intrigued to find this terrain so close to Eltham. The road is steep and my tiny car clings to its up-slopes and down-slopes like a cockroach attaches to the walls of a kitchen cupboard. A left-hand turn sends me bouncing over an even bumpier unmade road, then along ridges and gullies and past impressive entrances which, I guess, lead to equally impressive residences – I can’t see them. Adventure is certainly in the air. I’m relieved to finally arrive safely at my destination. 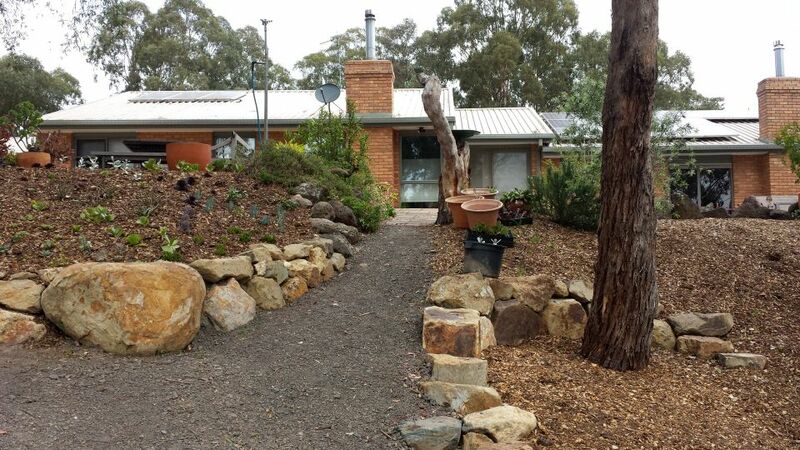 Rob’s pale brick house is situated close to the crest of a hill. It’s set back from the road amongst tall eucalypts and follows the curve of the land in a low sequence of rooms featuring large windows which seemed to invite the outside in. Two chimneys extend upwards from the roof and I image how pleasant it would be to sit inside the house on a winters’ day, warmed by a fire and watching the sway of branches and scurry of clouds in the wildness outside. As I park, I notice a series of posts which appear to be topped by nozzles and wonder whether these are part of a bushfire protection plan. The house is surrounded by native trees and the area appears to be vulnerable to bushfire risks. I also notice that the formal garden beds either side of the front door consist mainly of succulent plantings and wonder whether they have been chosen for their durability in tough conditions. Duang greets me warmly. She’s a slight woman who exudes calm energy. We’re inside the large kitchen/family area now and I watch as she moves quickly and with the confidence of one who is comfortable in their surroundings. I’ve been invited for lunch and look forward to her meal – her culinary skills are legendary. Rob, a man of cheerful demeanour and neat white beard, joins us as we sit to the table. The plan is that my interview will be conducted à la Annabelle Crabb’s Kitchen Cabinet television series, but with a slight change of format – there’s no need for me to help with the cooking. Whilst I can’t claim Annabelle’s interview skills, I can certainly attest to Duang’s cooking ability. 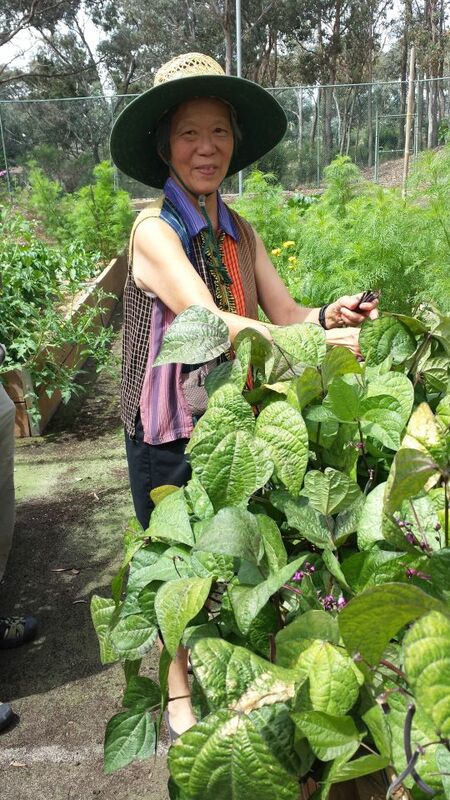 What she serves is delicious and, importantly, her ingredients are sourced almost entirely from her garden. After a colourful entrée of bocconcini, basil and multi-coloured cherry tomatoes in a light vinegar dressing, we move on to a main course of three Thai dishes which include boiled red rice; larb (good luck), a traditional celebratory dish consisting of tofu with garden greens and ground and roasted rice and, thirdly, stir fry prawns with Thai basil and seasonal vegetables. Click here to read Duang’s larb recipe. A beautiful berry semifreddo dessert completes the meal and leaves me with a clean, sweet (though not overly sweet) taste. How fortunate I feel to be treated to such fresh, colourful and tasty food. We drink Duang’s homemade kombucha with our meal. It’s a fermented drink made from fruit and natural flavourings. She offered two flavours – apple or blueberry – I opt for apple and am surprised by the effervescent drink tasting somewhere between beer and apple cider. It is slightly alcoholic, very drinkable and complements our meal perfectly. According to Mr Google, kombucha is “high in glucaric acid … beneficial to the liver … aids natural detoxification … supports healthy gut bacteria and digestion and helps the body assimilate food more easily.” I’m a convert. Over our meal, I ask how Rob and Duang have managed to produce their varied foods in obviously difficult conditions and Rob enthusiastically describes their path to planting success. He assures me that to dig local soils just isn’t possible – a ‘jackhammer’ is the only way the compacted soil can be broken up, he says. 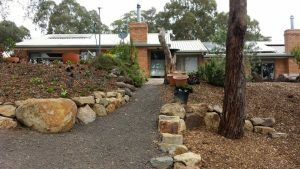 They had tried, initially, to create galvanised iron enclosed garden beds, but quickly learnt that attempting to feed and water their plants resulted in far greater benefit to their eucalypts. No amount of effort could stop the native flora and fauna – wallabies, as well as rabbits and deer – from competing with the vegetable interlopers! So they improvised. The former owners of the property must have been keen tennis players as there was a large enclosed tennis area carved into the slope behind the house. After some deliberation by Rob and insistence by Duang, it was converted into a vegetable garden and now supports 40 planter boxes, a potting area, mature potted fruit trees and a greenhouse. The whole space is protected from hot sun and birds by a network of shade cloth strips suspended by wires across the top of the court enclosure. The boxes are watered daily by Duang, by hand as she loves to connect with her plants – for her, watering is a pleasure rather than a chore. Early on, Rob experimented with the planter box design and finally settled on those encased with solid Australian red gum milled especially for the project. He housed each group of four boxes in redgum casings 4.8 metres long and then placed them in raised rows across the tennis court. This construction produced long lasting, efficient receptacles, perfect for growing when filled with their composted blend of horse and cow manures, straw, urine and sawdust to produce a rich, organic soil manufactured on the property. Major six monthly maintenance of their mammoth compost heaps is, predictably, Rob’s domain. We’re outside now, wandering through the garden, and I see a variety of crops, including tomatoes, basil, zucchini, okra, aubergine, cucumbers and beans, berries and herbs, tumbling out of the planter beds. They are flourishing and I’m envious. 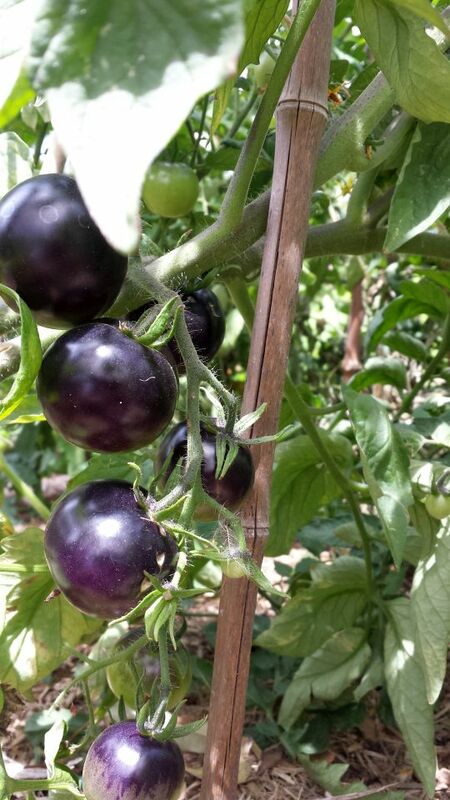 I’m especially fascinated by the tomato plants which are heavy with fruit of many shapes and promise to ripen into various colours and flavours. Some boxes are devoted wholly to herbs, whilst elsewhere I see basil peeking shyly from under spreading tomato plants and citrus trees which are hung with fruit. Colourful petunias and cosmos dance amongst the vegetables and deter white moths who apparently mistake them for territorial cousins and stay away. How beautiful it is to wander between the rows of greenery. On a highpoint above the tennis court enclosure stands an orchard of apricots and peaches draped in black netting and attesting to the constant struggle that we all have to balance our needs against nature’s. No more Real Food Catering? Duang is well-known locally as a caterer, trading as Real Food Catering. She is a self-professed ‘pescatorian’ – her diet consists of fish, fruit and vegetables – so I wonder how her preferences affect her catering. It seems that she isn’t exclusive – she cooks all ingredients and, apparently, her roast lamb is a ‘most asked for’ crowd pleaser. Inter alia, she led the team which provided the food for Nillumbik’s annual Home Harvest Feasts. This role involved coordinating the collection of produce donated by local home growers (memorable amongst them a small boy with a very long self-grown trombolini!) and creating meals for around 300 participants, with a proviso that each feast should have a different theme. 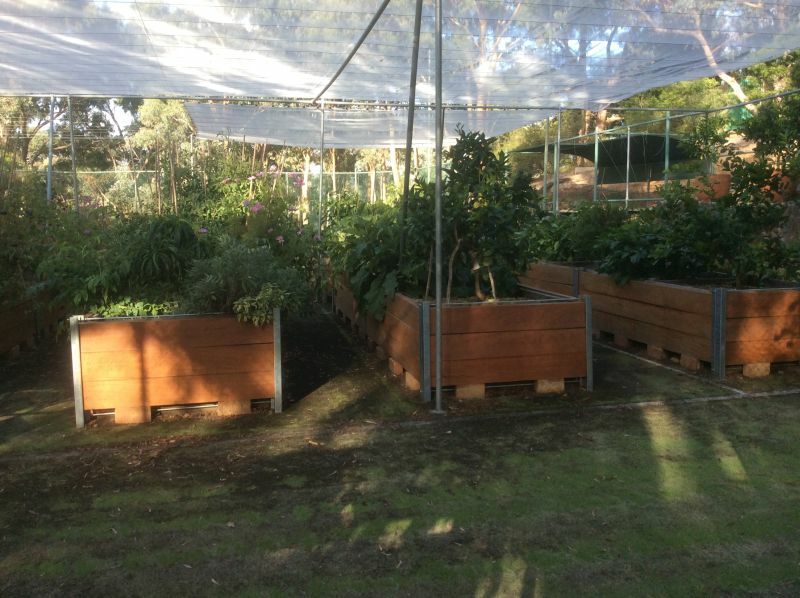 Whilst Duang and her team, undaunted by the extraordinary number of guests before them, planned and cooked the meals, Rob’s role was to ferry the menu’s hot food from the hospitality area at Eltham High School (where it was prepared) back to the harvest venue at Edendale Farm – the logistics are amazing! Judging by the pleasure with which they both speak of the Feasts, and my understanding that each year surpassed the previous year, the meals must have been amazing. However, as Duang and Rob’s world changes, so do their initiatives. She has recently decided to allow her licence to prepare food in her kitchen lapse. Real Food Catering will soon disappear, much to the disappointment of our community. But that’s not to say she has stopped cooking – never! There is another string to Duang’s bow (or is that leaf to her lettuce?). In 2017, under an initiative of the Victorian Sustainability Department she conducted eight workshops on the them of ‘love food, hate waste’ in conjunction with Edendale Farm and Nillumbik Waste Department. The workshops focussed on the concept of ‘waste free’; they weren’t about composting or worm farming but about using as much of everything in a plant or animal as possible (e.g. carrot tops, broccoli stems and cauliflower leaves). An image of discarded potato and carrot peels in my kitchen flashes before me. Her task during the workshops was to help people learn to minimise food waste. As she has been almost waste-free in her cooking since her earliest years, she says that developing and teaching the curriculum for this heart-felt topic came naturally and was an enjoyable experience. Duang says that she views food firstly as a health-giver with medicinal qualities and secondly as a leveller, a way to bond and nurture all members of society. She loves to prepare it and insists that all visitors and workers in her home sit at her table to share her meals. I feel that for her food is a cement which nurtures and bonds humanity. Her warmth and sincerity are disarming. There is something else that Duang does well – she writes with pure simplicity and style. She writes so well that she won the ABC PocketDoc Short Story Competition in 2015 – a fantastic achievement given the thousands of competing entries. Her story, My Silent Day, about blueberry picking in the Victorian alpine area, identifies the range of attitudes encountered by newcomers to Australia and is a wonderful example of her inner strength. It is a beautiful story and available to hear and read via this link. As part of the launch of the 2016 competition, Duang recorded a follow up story. The setting is one year later and Duang is again collecting blueberries. But this time her meeting is much more pleasant and heart warming. Listen to Duang’s follow up story. In preparation for our interview, I’d visited her Real Food Catering website, where I’d noticed other examples of her stories – the site includes a blog dedicated to her journey into food production on the tennis courts – it’s well worth reading. Several hours after arriving, I leave these two lovely people and head for home feeling privileged to have had the opportunity to visit. In my hands I clutch a brown paper bag replete with all manner of the freshest and shiniest of herbs and vegetables and, in my head, the start of a story. So then to the bumpy road home! What a great article! It captures well Duang and Rob’s totally inspiring love for growing and cooking fresh seasonal food. The care Duang takes in her gardening and cooking, plus her generosity in sharing it with her friends and community, is unsurpassed. I went to Duang and Rob’s place with my neighbour and I was impressed with what they told us about their farm and the quality of produce that they showed us. Thank God for their hospitality and we tasted some great produce for free. I wish I could learn more from this couple again in growing veggies in particular.